The Israeli novelist, Amos Oz, described Yitzhak Rabin as ‘not a charismatic man, but rather a logical, skilful captain’. Rabin was both a political dove and a military hawk, who never pretended to be a far-sighted intellectual, had no small talk and even found canvassing possible supporters ‘a herculean task’. Yet such an introverted figure was able to make peace with Israel’s historic enemy, Yasser Arafat’s Palestine Liberation Organisation. Itamar Rabinovich, a Tel Aviv university academic and expert on Syria, was appointed by Rabin to take charge of the vexed negotiations with Hafez al-Assad’s authoritarian regime. Few are better placed to write an account of Rabin’s life and times. Ambassador Rabinovich rightly argues that Rabin’s journey should be measured by his accomplishments in life and not by the manner of his death at the hands of a member of the far right in November 1995, following a peace rally. In this excellent biography, it is Rabin’s sense of independence that predominates. He regarded the soldier and politician Moshe Dayan as ‘totally reckless’ in the way he dealt with people. He refused to bow to David Ben-Gurion’s will and was thus marginalised. Instead of promotion, he was sent to Camberley Staff College in the UK. Rabin regarded his great rival, Shimon Peres, as ‘an indefatigable intriguer’ and he stood up to the American Israel Public Affairs Committee (AIPAC), the leading US pro-Israel advocacy organisation. Unlike many Israeli politicians, he did not cling to office as the be-all and end-all of his existence. Before the Entebbe raid in 1976 – in which Israeli commandos rescued hijacked passengers from Idi Amin’s Uganda – Rabin dictated his resignation letter in case things did not go to plan. It is also well known that he resigned as prime minister in early 1977, when his wife was found to possess a technically illegal foreign bank account. He was appointed Chief of Staff of the Israel Defence Force in 1964, but Israel’s lightning victory during the Six Day War three years later was received by Rabin with mixed feelings. Shortly afterwards, Rabin was appointed ambassador to the United States, but had a tortuous relationship with Israel’s foreign minister, Abba Eban. Despite his success as a diplomat, he was passed over several times for posts by prime minister Golda Meir. One factor was that he was not well disposed towards the West Bank settlers. Keeping Ramallah was not ‘a question of life and death’ for him. During his first term as prime minister from 1974, he labelled the settler movement as ‘a cancer in the social and democratic tissue of the state of Israel’. He disparaged their claim to be a reincarnation of the 1948 generation and argued that maintaining control over a million and a half Palestinians posed a demographic threat to the Zionist experiment. After numerous electoral failures by Peres, Rabin was elected once more as Labour party leader and duly won the 1992 election. Rabinovich was appointed initially to assess the feasibility of negotiating with the Syrians, rather than with the Palestinians. Yet when the Syrians presented their first paper on the situation, the word ‘Israel’ was omitted. Rabinovich argues that Rabin wished first to explore the Syrian option and offered the Americans a ‘hypothetical, conditional willingness’ to withdraw from the Israeli-occupied Golan Heights, despite the fact that Peres would oppose him and that many of the Golan inhabitants were actually Labour voters. The Syrian approach was maximalist, vague and intransigent. Despite this, the American interlocutors had, crucially, not kept in reserve Rabin’s potential offer to withdraw. They blandly placed it on the negotiating table to no avail. 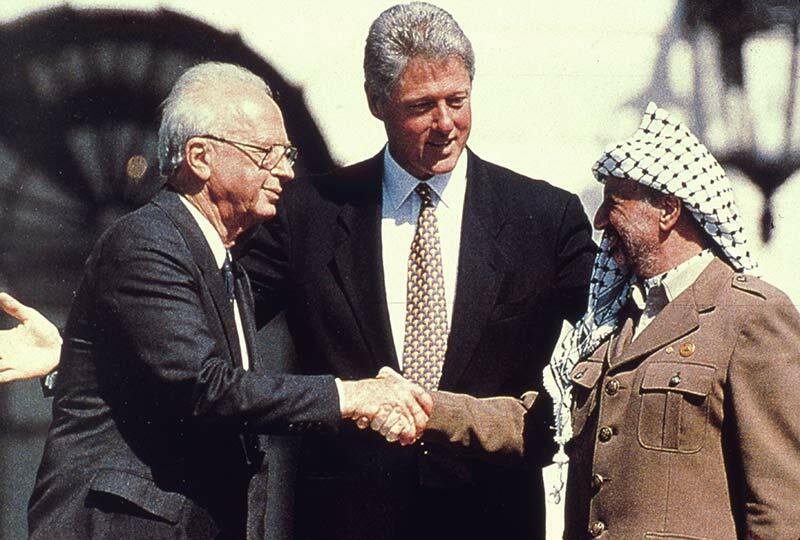 It was this action that persuaded Rabin, according to Rabinovich, to emphasise instead the Palestinian track, which eventually led to the Oslo Accord in 1993 and the handshake with Arafat on the White House lawn. The black cloud of Rabin’s murder in 1995 hangs over this book. Rabinovich argues that the assassination was a watershed in the move to the right and that the wider circle of those responsible for the incitement before the killing have still not been brought to justice. This well-crafted work raises profoundly moral questions about Israel’s trajectory and what could have been rather than what is. Colin Shindler is an emeritus professor at SOAS. His latest book is The Hebrew Republic: Israel’s Return to History (Rowman & Littlefield, 2017).